Drinking alcohol is one of our societies favorite pastimes. It is unusual to hear someone guy. “no thanks. I don’t drink.” And if you do hear these unexpected words you’ll also hear a lot of people’s reactions, – or “Oh, have just one.” So consequently if you are not a drinker you’re exposed to this pressure quite a bit. There are many reasons why people drink. Some just like to be sociable. Many people will use this excuse. Unfortunately, if the person really thought about it, most of the time I doubt if this would be the reason they came up with. Then you have the totally honest person that will say I like to get drunk. That to, may be true. But I believe there are other reasons, that perhaps even the person drinking is not aware of. There are people that can drink a few drinks and then stop. And there are some that start drinking and don’t know when to stop. I’m sure you’ve seen this type of person at a party. They get so drunk that they are falling all over the place, and still will say, “I’m not drunk.” Many times they really believe it. Alcohol is known to lower inhibitions, and many people drink it for that purpose. They want to do something that they couldn’t do otherwise. Plus, they can blame it on the alcohol afterwards. People drink when they are depressed, people drink when they are happy. Young people drink, old people do loo. Some drink more than others, some think they can drink more than others. There are people who will only drink one certain kind of drink. And then there are those that have a few favorites. And then there are those who will drink anything. Many people will drink before attempting something they are afraid to do. I have been told several times by different people that what people do when they are drunk is something they subconsciously wanted to do, but their personality wouldn’t allow it. I don’t know if I fully believe this. I realize that it’s probably true some of the time, but not all the time. Another aspect of drinking that I have always wondered about is why do people forget things while drinking. I have heard many people say you forget because whatever it is, clashes with your way of thinking or acting. And if you remembered it could be harmful to you. I kind of have mixed feelings about both of these aspects of drinking. I have found through my personal experience, that different drinks have different affects. For instance, I have been told that tequila makes some men violent, and champagne makes some women affectionate. 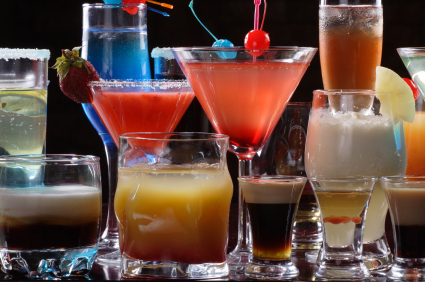 If you probably thought back, you would realize different affects different drinks had on you.